Importance. 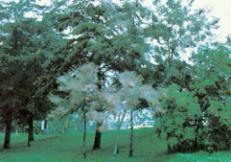 - The fall webworm is not considered an important forest pest. However, ugly webs can seriously detract from aesthetic values. The preferred hosts in the South are persimmon, pecan, and sourwood. Identifying the Insect. - The adult moth has a wingspan of 1 (25 mm) to 1 1/4(31 mm) inches and is snowy white, usually with dark spots on the wings. The larvae are 1 (25 mm) to 1 1/4 (31 mm) inches long and covered with silky hairs. The color varies from pale yellow to green, with a black stripe on the back and a yellow stripe on each side. Larva. (Click for detail. JPG 35K). The pupae are found inside a gray cocoon constructed of silk, frass, and debris. The eggs are small, yellow, or light green, and turn gray before hatching. Identifying the Injury. - Usually the first signs of attack are the large, silken web and skeletonized leaves. 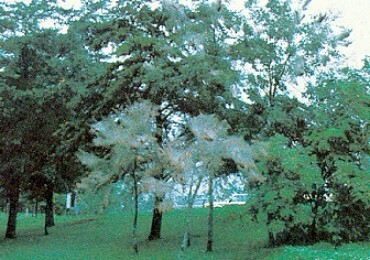 The silken web usually contains large numbers of caterpillars. Typical damage showing large tents. (Click for detail. JPG 54K). Biology. - The moths emerge in the spring. After mating, females lay eggs in masses (400 to 500) on the undersides of host leaves. The eggs hatch in approximately 2 weeks, and the larvae immediately begin to feed and construct webs. They enlarge the web as they continue to feed for 4 to 8 weeks. Then they spin a pupal cocoon in a sheltered place or in the duff or soil. There are at least two generations per year in the South. Control. - Biotic agents, and unfavorable weather take their toll of these insects. Occasionally, chemical control may be necessary.